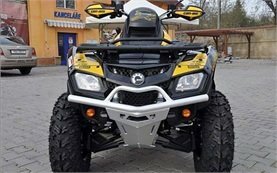 2UP ATV-quads are a great rental choice to explore and enjoy Bulgarian nature with a friend beside. Designed and constructed for 2 riders, they may be used for business, hunting, fishing or just for fun. The best 2 UP models feature 4 by 4 drive system, powerful engines, huge fuel tanks and comfortable, non-slippery seats. Ergonomics are important on any quad bike, but even more so on a 2UP. Safety is from significant importance in this class and big manufacturers offer additional protection with side nets and a protective construction made to endure accidents or rollovers. Many manufacturers make their models with protective, lightweight vent, rearview mirrors and a lockable spacious luggage case. Additional comfort is provided from heated handlebars for cold days and even a coffee cup holder. 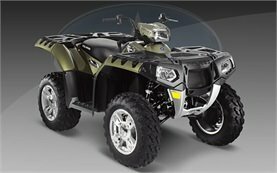 Some of the best 2UP ATV examples include Can-Am Outlander Max 650 XT, Polaris Sportsman 500 H.O. Touring, Suzuki King Quad 500cc and Arctic Cat 700 TRV 2UP. If you want to share riding in areas too remote to be seen on foot with a friend beside and experience Bulgarian nature first-hand safely at your own pace, the 2UP touring ATV is the proper vehicle for hire.